Erin has been in the party business for so many years she can’t share because she doesn’t want to age herself. Her high energy and magnetic personality make her a perfect candidate for entertaining children of all ages. She plays, engages and laughs until the children laugh with her. Erin opened the company 2007 and it has been partying on ever since. Erin’s full time job is that of an actress. She has found a great way to balance both of her worlds with the help of her amazing team. She has found a way to combine both her love for children and theater by starting a summer camp, Acting Out, with fellow performer Shaun. Acting Out is a fun camp for ages 7-12. Inquire with Erin for details. Brianna is wonderful gift to any company that works with children and Parties By Erin is lucky to have her. She has been a part of the team for a few years now, however she and Erin worked with kids together long before that. Brianna works full time as a parent consultant and behavioral therapist for In Stepps. Brianna is fun, kind, and one of the most trustworthy people Erin knows. Jessica is one of our specialty performers. Jessica is our resident face painter and balloon artist. She is also a talented musician. She plays and teaches the guitar, ukulele, piano and singing. If you would like more information on Jessica, to teach music or would like to add her to your party, contact Erin. Megan joined the PBE team about 3 years ago. She and Erin are dear friends, and much like Erin, Meg has a zest for life, a gift with kids and a sunny disposition. Meg has a passion and knack in working with non-profit groups. She rocks with kids of all ages, and has special way with crafts, games and can run a kick @$$ camp! Meg brings new and exciting ideas to every party. Hedy is our resident princess. Just look at her, she’s beautiful!! However, she can get rowdy with the boys and has done her fair share of super hero parties. 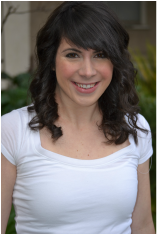 Hedy is an actress, and she and Erin met 4 years ago at The Groundlings School of Improv. With her sweet disposition and great sense of humor, Erin knew she would be a magical addition to the Parties By Erin team! And she has been!!! Katie has been working for Parties By Erin and Co since Erin started the business back in 2007. Katie’s high energy, creative mind and back ground in working with kids makes her a perfect for this job. She teaches gymnastics, runs a children’s fitness facility and works for a company called the Quantum Learning Network writing curriculum and facilitating large groups of children ranging in ages 6-18. Favorite Party Activity- group games!! Fun Fact- most of the games for our older kid parties were created and taught to us by Katie. Jamie has been with Parties by Erin and Co for little over a year now, but Erin and Jamie had worked for many years together doing parties prior to PBE. Jamie has been dancing for over 20 years, and still loves to perform in musical theater when her schedule permits it. Gymnastics is Jamie’s newfound love. When she’s not dressing up for parties, Jamie works as a membership and gymnastics center coordinator for the Weingart-Lakewood Family YMCA. Go visit her!!! Fun Fact- She’s a twin!! John was one of the first male performers Parties By Erin brought aboard! Erin and John have done a ton of theater together, which makes him a fantastic performer. His fun, loving energy and dry sense of humor make him a perfect combination for both children and parents to enjoy. John runs educational and fun school assemblies, is part of an improve team and has a great blog in Geeks Corner. © 2015 Best Parties By Erin and Co. All rights reserved.